But Halloween isn’t just for kids. Below, a Reynolds Penland ad for adult costumes, which include skeleton, devil, and “whoopee” suits. No pointed hats, but there are accessories — just look at those shoes! And lastly, an ad for glass cleaner. 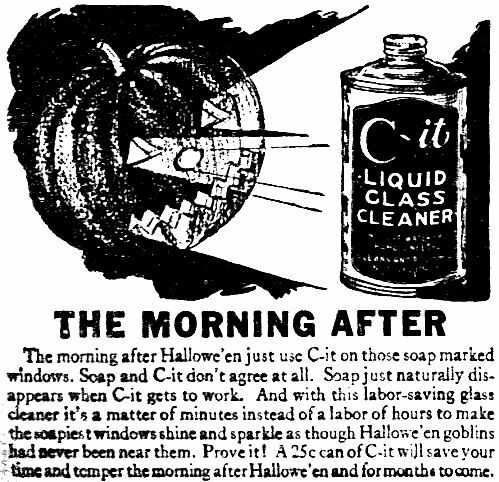 Dallas had a MAJOR problem with unruly “goblins” soaping windows — especially downtown — and this product probably came in pretty handy on “the morning after.” I bet this was the busiest time of the year for the C-It Liquid Glass Cleaner company — their make-it or break-it sales period. Halloween might well have been their Black Friday. …Or rather their Orange and Black Friday (because those are the “proper colors”).